The Visit Hendricks County staff scoured Hendricks and Morgan counties looking for One-of-a-Kind Finds you can only purchase here. In many cases, that means these gifts are handmade by local artists. This installment focuses on all of the women in your life. Even if these specific gifts and experiences don&apos;t sound quite right for your loved one, we do suggest visiting each of these small businesses as they just might have something else that is a perfect fit. Virtually any woman would love to take a trip on our Rural Routes to Main Street Cultural Trail, a self-guided, self-directed driving tour with more than 30 stops in Hendricks and Morgan counties including art galleries, restaurants, handcrafted gift shops and much more. We figure all she needs is that little nudge, so why not take a look at the cultural trail&apos;s stops, find a few that you think she would like to visit and contact them about classes, demonstrations or gift certificates. Virtually all of the stops offer them. She could get what she wants, enjoy a day away from home and she will have you to thank for it. When it came to scarves, we found a lot of options during our scouting, but our favorites were found at Gallery on the Square, 51 S. Washington St., Danville. Handmade through a nuno-felt process, these scarves caught our eye because of the rich textures, colors and different options available. A wool-roving technique that requires no sewing results in a fabric that is durable, warm and very light. Every scarf is truly original, and cost under $100. 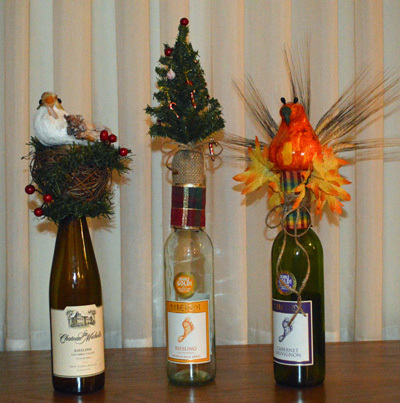 We found some amazing wine toppers at Fleurs de Beausoleil, 8024 Main St. in Coatesville, that we thought would be a great way to give wine as a gift as an alternative to the typical wine bags. These handmade keepsakes are designed by the flower shop&apos;s owner, Koren, who uses the same materials she has on hand to make her beautiful flower displays. They come in different themes and colors and fit over the top of any wine bottle. They sell for just $12. Seize the Night Designs, 51 W. Marion St., Danville, provides a treasure trove of amazing gift ideas, but one in particular that caught our eye are their stylish necklaces that can be custom made for any mother or grandmother to include the names of their children or grandchildren. These hand-stamped necklaces come in various styles and fonts and range in price from $20-$35. We found some amazing glass ornaments at Artistic Designs Gallery, 1038 E. Main St., Brownsburg. The ornaments made by local artist Lisa Pelo are just one of a number of amazing glass pieces she makes at her shop, Hot Blown Glass, in Clayton. These ornaments, which come in various colors, shapes and sizes, and all of Lisa&apos;s glass creations are truly something to behold and are definitely one-of-a-kind finds. The ornaments range in price from $15-$22. In addition to Artistic Designs Gallery, Lisa&apos;s work can also be found at Bread Basket Cafe & Bakery in Danville and Frazee Gardens in Brownsburg. Last year we profiled one of Pam Hurst&apos;s collection of jewelry, her mother&apos;s necklaces. This year, we decided, Pam had so many unique creations and a legendary background for fashion, that we wouldn&apos;t point out one specific item, but instead just recommend adding the trip to her store in Martinsville a must for your holiday shopping needs. Her store, The Sterling Butterfly, is one of our Rural Routes to Main Street Cultural Trail locations and is located at 190 E. Morgan St. in Martinsville. 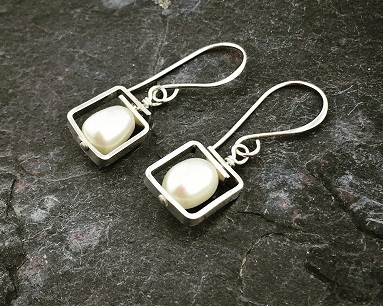 Pam&apos;s jewelry is even red-carpet worthy as evidenced by her creations being featuring on the Academy Awards, Golden Globes and the television show, The Vampire Diaries. So make the woman in your life feel like a celebrity this holiday season by picking out jewelry from the Sterling Butterfly. We found these great handmade bags made by Cinda Davis at Carol&apos;s Boutique, 2 E. Main St., in Pittsboro. The larger cloth purses include several pockets, making them ideal as a carry-on bag when traveling or as an everyday handbag. They also sell these great Indianapolis Colts cross-body, see-through handbags that are perfect for bringing to the games on Sunday. The purses cost about $25. The boutique offers several other handmade items from hats, to ribbon necklaces to wreaths for the holidays. It never ceases to amaze us how many great gift ideas can be found at Gallery on the Square. So, since we started this post with scarves from there, what better way to end it then to profile one other item? We loved the wooden letter blocks that can be used seasonally to decorate your home or office. These fun and festive blocks featured phrases like Let It Snow, Happy Thanksgiving and Hope for breast cancer awareness and range in price from $9-$30. As you can tell, we recommend visiting Gallery on the Square and all of the other shops featured in our Holiday Gift Guide as there is so much more to be discovered for someone you love.